There's no question that running while pushing a jogging stroller provides a more strenuous workout than running alone. Figuring out exactly how many more calories you're burning while running with the added effort of pushing your child in a stroller, however, is no sweat. A host of calorie calculators, many of them free, are available online so with the click of a button you can easily figure out how much more effective your workouts are with your child in tow. Search online for any one of a number of free calorie calculators. Make sure the one you select includes an option for calculating calories burned while jogging and while jogging with a stroller, such as the calculator at HealthStatus.com. Calculate how many calories you burn while running without a jogging stroller. To do this, enter your weight, the number of minutes you run and the approximate speed at which you run. In the case of the calculator at HealthStatus.com, the speed options range from 5 miles per hour for a 12-minute mile to 12 mph for a five-minute mile. Still using your calorie calculator, calculate how many calories you burn pushing a stroller. Be sure to enter the same number of minutes you used when figuring how many calories you burn while running. 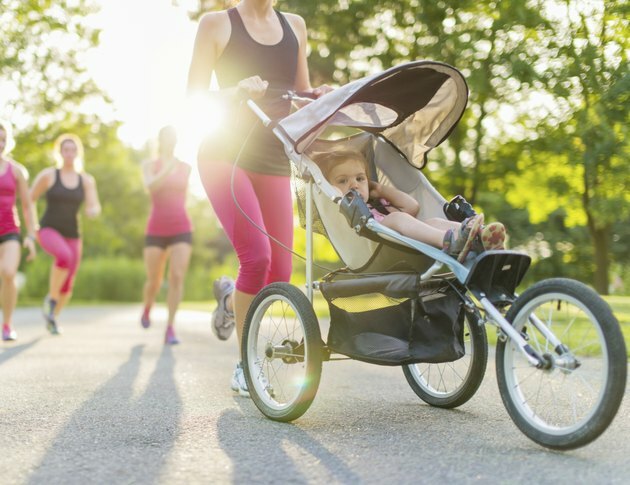 Add the number of calories you burn while running and the calories you burn while pushing a stroller to determine how many calories you burn while running and pushing a stroller at the same time. For example, according to HealthStatus.com, if you weigh 150 pounds you burn 171 calories running at 6 mph for 15 minutes. Pushing a stroller burns 45 calories for the same 15 minutes, for a total of 216 calories. The HealthStatus.com calculator even adds the two figures for you, so there's no confusion. For the best calculation, try to be as accurate as possible regarding entering your weight and how fast you run. Online calorie calculators only provide a general estimate of the number of calories you burn during any activity. Temperature, terrain and many other factors will influence the actual number of calories you burn.